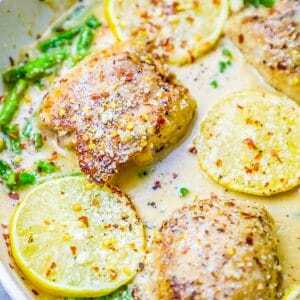 Easy Lemon Garlic Butter Chicken Thighs Recipe is a one pot chicken thigh dinner guaranteed to impress even the pickiest eaters – bursting with rich lemon garlic butter flavor and crispy, crunchy chicken thighs in under 20 minutes. 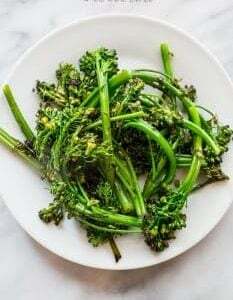 Perfect in salads sandwiches or wraps, over pasta & rice, or on its own with vegetables. 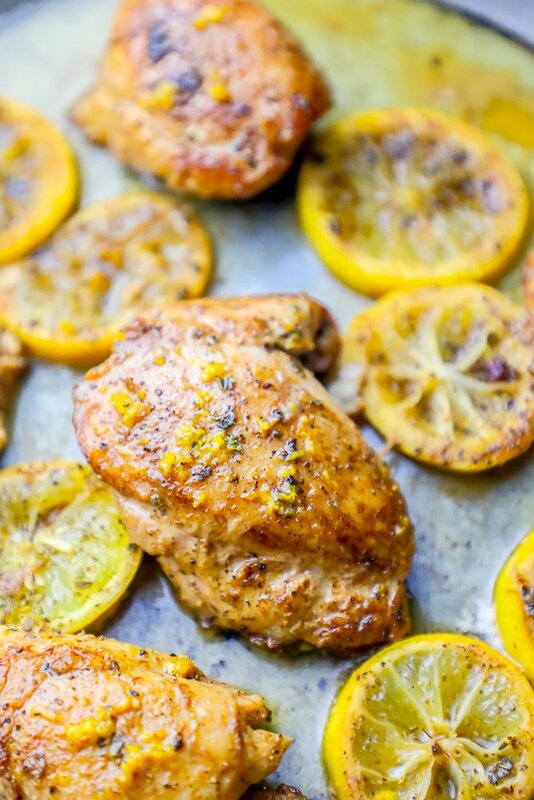 This simple and easy lemon garlic butter chicken thighs recipe – a simple and super adaptable pan fried chicken thigh recipe- is packed with lemon garlic butter flavor for perfect easy chicken thighs that are crunchy, never-dry, and totally delicious! 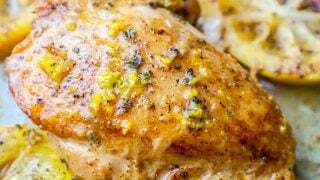 Try these flavor packed lemon garlic chicken thighs in a wrap, sandwich, or salad with your leftovers – it makes an amazingly delicious meal the next day. 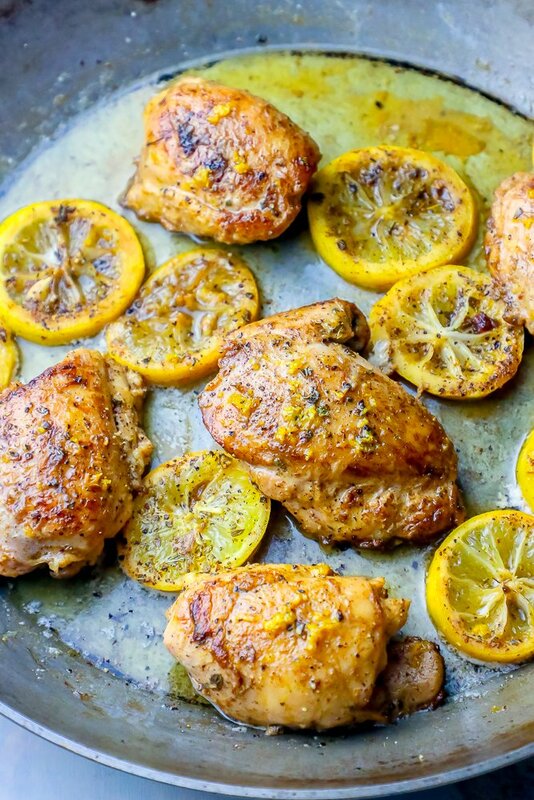 Just take me to the Easy Lemon Garlic Butter Chicken Thighs Recipe Already! 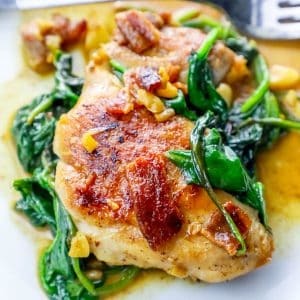 If you’d rather skip my (very helpful, i think) tips and tricks, essential cooking info, and similar recipe ideas – and get straight to this deliciously easy pan fried garlic lemon chicken thighs recipe – simply scroll to the bottom of the page where you can find the printable recipe card. Pat Chicken Thighs Dry Before Frying. Be sure to thoroughly pat chicken dry before frying on the stove – this will help your chicken crisp properly. If you hate flabby chicken thighs, this is the most important step to be sure you will have perfectly crunchy chicken thighs – do not pan fry chicken thighs soaked in water from packaging! 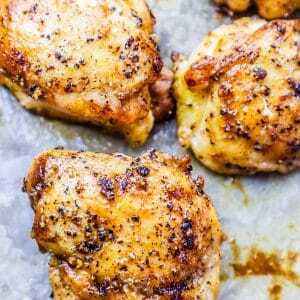 Use Clarified Butter to Pan Fry Chicken Thighs. While you can use butter or olive oil if you prefer, I think the flavor from ghee/clarified butter is the absolute most delicious fat to pan fry chicken in! Clarified butter gives chicken thighs a rich, salty, and buttery flavor – plus it has a higher smoke point, so you have less to worry about as you pan fry your chicken thighs. Let Chicken Thighs Crisp Before Flipping. If you flip your chicken too much, you won’t develop a lovely golden brown crunchy texture everyone loves. Give your chicken time to crisp before flipping! You can check to see how the chicken is doing by lifting one side with a spatula. If the chicken looks well browned, go ahead and flip. The #1 complaint against chicken thighs is their texture – they have more fat and an uneven shape, which can sometimes give chicken thighs a weird flabby texture. 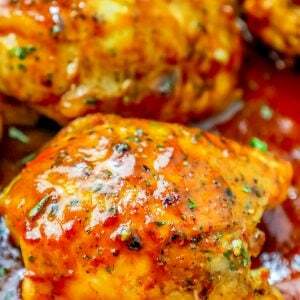 To prevent an uneven or soggy texture, I like to unroll my chicken thighs, so they cook flat. While unrolled chicken thighs look a little funny, they crisp beautifully and cook more evenly, and they have more surface area to soak up all the delicious garlic lemon flavor. 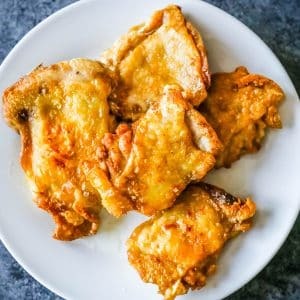 If you love this delicious keto pan fried chicken thighs recipe with tons of lemon garlic flavor, please be sure to check out some of my other favorite low carb chicken dinners! These chicken thigh recipes are all super simple – just one pan – and take under 30 minutes with very little carbs, making them perfect low carb chicken thigh recipes you’ll want to make again and again. Chicken thighs are permanent residents on my family’s weekly rotation because they are so delicious, easy, and versatile – and taste great alongside vegetables, rice, pasta, cous cous, salad, and more! 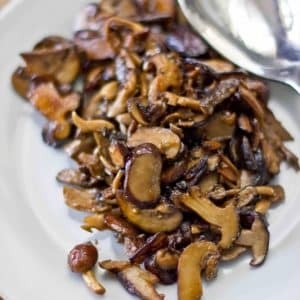 I’m sharing some of my favorite easy sides – both low carb and family friendly – to serve with pan fried chicken thighs below. 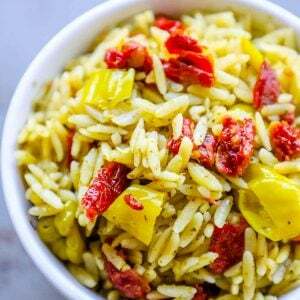 Simply click the link to find each easy printable recipe! 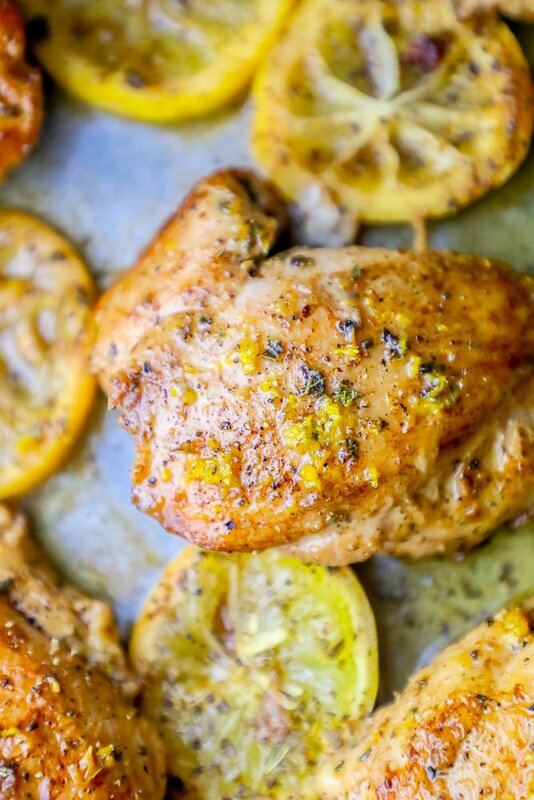 If you love this Easy Lemon Garlic Butter Chicken Thighs Recipe as much as I do, please write a five star review, and be sure to help me share on facebook and pinterest! 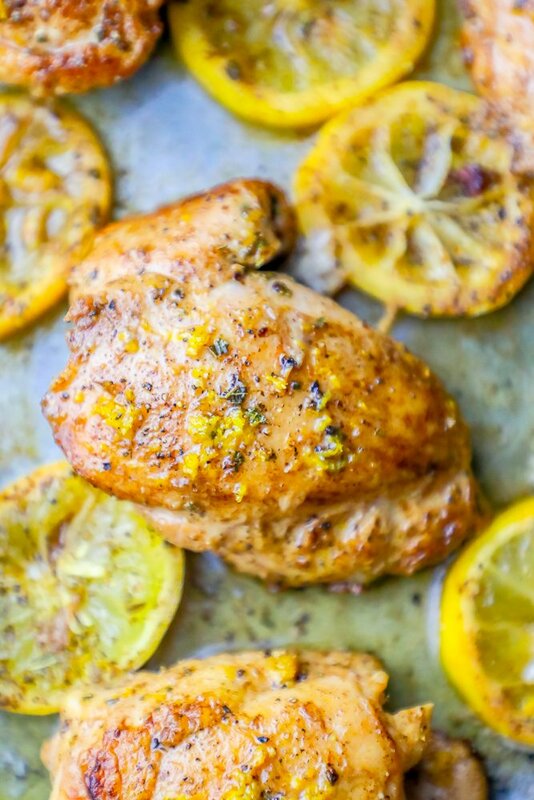 Easy Lemon Garlic Butter Chicken Thighs Recipe is a one pot chicken thigh dinner guaranteed to impress even the pickiest eaters - bursting with rich lemon garlic butter flavor and crispy, crunchy chicken thighs in under 20 minutes. 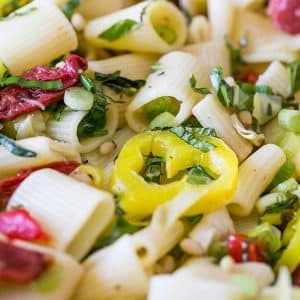 Perfect in salads sandwiches or wraps, over pasta & rice, or on its own with vegetables. In a large, heavy pan, melt butter until liquid and shiny on high. Add chicken to pan and cook 3-4 minutes until one side is golden brown and crunchy. Flip and repeat for other side. Reduce heat to medium. 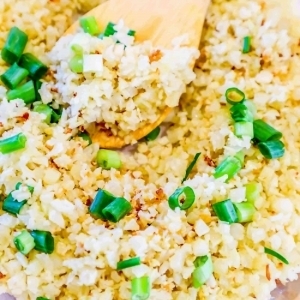 Add diced garlic to pan, stirring quickly to prevent burning. 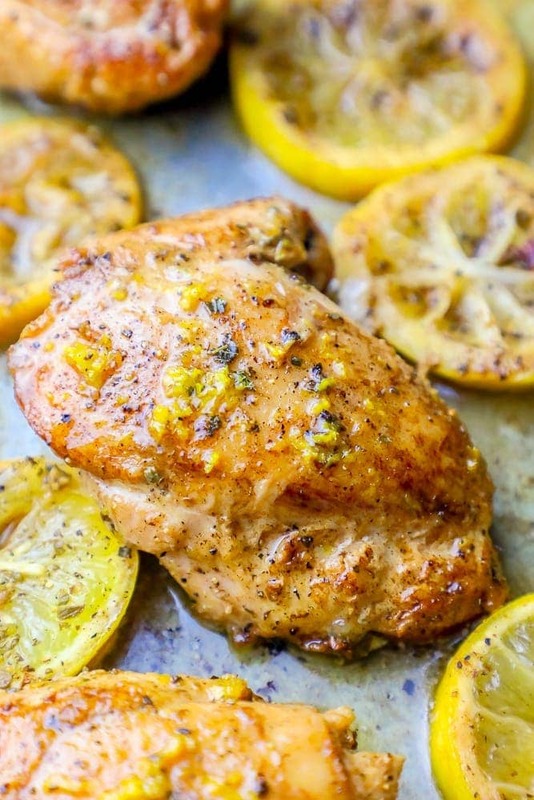 Sprinkle lemon zest over chicken thighs. 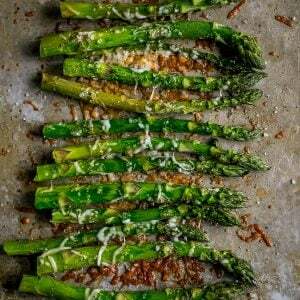 When garlic is soft and fragrant (not burned), add oregano, lemon slices, and wine. 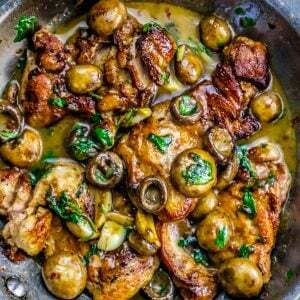 Cook until sauce has thickened and chicken thighs have reached 165 degrees internally.